It’s St. Patrick’s Day...and I don’t have an Irish or green-themed recipe to share with you today. But...I'm wearing a U2 t-shirt...does wearing an Irish rock band count?!? Easter is just around the corner, and I have really fun recipe and giveaway to share with y’all today. Last fall, I tasted Biscoff Spread for the first time, and I immediately fell in love! If you like Biscoff cookies, then you’ll LOVE Biscoff Spread: it tastes just like the cookies, but in a creamy spreadable form. It has the texture of peanut butter and the buttery-cinnamon-caramel taste of Biscoff cookies. I featured the spread last year in my Triple Threat Biscoff Blondies. Biscoff Spread is terrific mixed into softened vanilla ice cream, paired with apple slices, or even straight-up on a spoon. Biscoff recently sent me a jar of their newest creation: Biscoff Crunchy Spread, to create an original Easter-themed recipe to share in here. 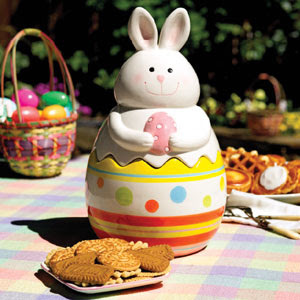 Not only that...today truly IS your lucky day: they’re going to give one of you a gift pack containing two jars of Biscoff Crunchy Spread and this ADORABLE ceramic Easter Bunny cookie jar that’s filled with a variety of individually wrapped Biscoff cookies!! Biscoff Crunchy Spread features little pieces of Biscoff cookies mixed into the creamy spread. How is it, you're wondering? AMAZING...and totally addicting!! I’m a crunchy peanut butter lover, so I loved the extra crunch of this spread. This stuff is so good that I had to force myself to save half the jar for today’s featured recipe rather than dip my spoon into the jar every time I walked into the kitchen. That’s how good it is!! I considered making cupcakes, then a cheesecake...and then? A light bulb went off: if I can make Peppermint Oreo Truffles for Christmas, why not Biscoff-Toffee Easter Truffles?!?!? These truffles are simple to make, totally delicious, and contain a few ingredients. It doesn’t get much better than that! Step 1: Add an 8-ounce package of Biscoff cookies (32 cookies) to the bowl of a food processor and process into fine crumbs. Place the crumbs in the bowl of a stand mixer. Add 6 ounces Philly White Chocolate Indulgence Cream Cheese (or 6 ounces softened regular cream cheese), 1/2 cup Biscoff Crunchy Spread, and 1 tbs. vanilla bean paste (or vanilla extract). Combine on low speed until the mixture is combined and looks a bit like mud. Then add 2/3 cup Heath Bits 'o Brickle toffee pieces and mix on low until the toffee bits are evenly mixed into the truffle mixture. Step 2: Use a cookie scoop to portion the truffle mixture into uniform portions. Roll the truffles into bite-sized balls and place them on a baking sheet lined with parchment or a Silpat. 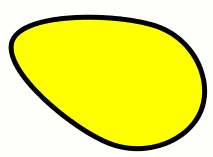 You should end up with about 18-24 truffles, depending on the size of your scoop. Place the baking sheet in the freezer for about 30 minutes. This will help the melted coating adhere to the truffles more easily when you dip them. Step 3: Melt a 14-ounce package of tinted white chocolate candy wafers. I used pink ones, which I found at Hobby Lobby. I find the best way to dip the truffles is to stick a skewer into them slightly for dipping...then use a toothpick to repair the little hole left when you remove the skewer. I decorated these truffles with assorted Spring sprinkles that I also found at Hobby Lobby. I store the truffles in the fridge and take them out about 10-15 minutes before serving. These truffles are super-cute and really yummy...and they're a snap to make. This is my kind of baking: simple, fun, and festive! They look like you put way more effort into them than you really do...but I won't tell if you don't!! I made my truffles round to keep things simple. However...if you’re more adept in the baking/creativity department that I am, you could totally shape these truffles like eggs and decorate them to look like Easter eggs. I plan to serve these truffles as part of my Easter festivities...and I hope you will too. I had originally intended to dip these truffles in white chocolate...and then I discovered these tinted candy melts after work yesterday. But no worries...I know just what to do with the white chocolate and the rest of my Biscoff Crunchy Spread: I'm going to make a batch of Biscoff Cookie Bark from the blog Hugs and Cookies. I remembered seeing this on Danielle's blog last week, and it looked so amazing. I can't wait to make this bark, because I know it's going to be amazing...I just might be the most popular gal in the office next week! So...who wants to win the two-pack of this amazing Biscoff Crunchy Spread and the super-cute ceramic Easter Bunny cookie jar?!?!!? To enter, leave a comment below telling me how you would use the Biscoff Crunchy Spread in your kitchen. For a second entry, you can Like The Weekend Gourmet on Facebook (or tell me that you already do). Make sure to leave a separate comment for each entry, AND don't forget to include your e-mail address. I will accept entries until noon on Wednesday 3/21. The winner will be announced that afternoon, and Biscoff will ship the prize pack to the winner in time for them to use for Easter! In the spirit of St. Patrick’s Day: "May the luck ‘o the Irish be with you!!" Good luck!! IF I were able to get the spread, I'd use it as a dip for Anna's Almond thins! I CAN get the at my local Super Wal*Mart!